For many, one of the not so enjoyable experiences of aging is losing hair. While hair loss in elders is a normal part of getting older, many people would like to retain their hair despite their age. The official term for hair loss is alopecia. There are many forms of hair loss. When the hairs on your head gradually gets thinner and fewer in number as you age, this is known as involutional alopecia. What happens behind the scenes, so to speak, is that your hair gets produced in hair follicles that are situated on the outer layer of your skin. Each follicle is independent of the other others, which gives them different life cycles. As new hair cells arrive, old ones move out past the surface. These old cells, now visible, are what we call ‘hair.’ But they’re actually dead cells of keratin (the protein that makes up hair, which is produced in the follicles). The follicle has 3 stages during its life cycle, the final one being telogen, which culminates with the hair shedding. At that point a new cycle starts. 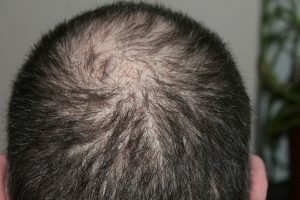 With age, hair grows slower, and Involutional alopecia happens when many hairs enter the final resting phase. or make your existing hairs healthier. They, therefore suggest going through a thorough checkup before you start any treatment. This can also help rule out any other causes of hair loss. Has something worked for you?